LAKE PLACID, N.Y. -- Phil Housley, who will coach the U.S. team at the 2013 IIHF World Junior Championship, gave two words of warning to the 45 players who were invited to the USA Hockey National Junior Evaluation Camp: Come prepared. After a week that saw his players skate in intrasquad games as well as contests against Finland and Sweden, Housley said he thought it was a productive time. "I was pleased about the whole week," Housley said. "Especially after the first couple days, it seemed like we were a little sluggish. (It) seemed like our games picked up in the third game and the international competition. I was very pleased by their effort. (I) talked to them, sent out the letter in June, to come prepared, and for the most part all of these guys worked hard and came prepared for this camp." After two intrasquad games and two split-squad games, Housley and the USA Hockey staff trimmed the initial group of 45 to 34 and went 2-1 in international games. 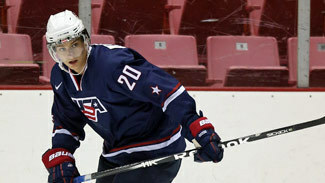 The highlight was a 10-2 win against Sweden, the 2012 WJC champions, on Thursday. Team USA also split a pair of games against Finland, winning 5-2 on Wednesday and losing 3-2 in overtime on Saturday, the final day of camp. "The Sweden game, obviously, we were on the puck in the offensive zone first, our F1 (first forechecking forward) pursuit was very, very good," he said. "Our forecheck in the neutral zone, which caused a lot of turnovers in transition for us, that's what we're looking for. Pushing teams into a spot where they don't want to be, causing mistakes. I think from our transition game, moving forward was excellent. Speed on the outside, guys going for the net, paying the price. That was the high point for me." Housley wasn't ready to single out any individual performers, instead saying he was happy with how all the players grasped the system and style of play the coaching staff implemented. "Especially the forecheck and neutral-zone forecheck," he said. "The other offense, inside the zone, power play, we were throwing a lot of different combinations out. For the most part they understood our breakout. And our penalty killing I thought was very, very solid this week. We're going to try to continue to implement those things when we get back in December. We don't have a lot of time. Hopefully they got a little taste of it this week and they'll be able to implement that when they get back in December." Housley knows he'll have a number of hard decisions to make when creating the final roster Team USA will send to this year's tournament, which starts Dec. 26, in Ufa, Russia. Among the hardest could be on defense, where of the 11 players who survived the first round of cuts, five were taken in the first two rounds of an NHL draft, with another (Seth Jones) expected to be one of the first players picked at the 2013 NHL Draft. Jones and Jacob Trouba played only in the rout of Sweden, but they're considered locks to make the team. Philadelphia Flyers 2012 third-round pick Shayne Gostisbehere was impressive during this camp, with two goals and two assists in five games. Mike Reilly, a 2011 fourth-round pick of the Columbus Blue Jackets, also stood out in the offensive end. "You saw in the games … especially against Sweden, we really controlled the play back there," Housley said. "Anytime you can move the puck up-ice quickly so they can't let the other team get into a forecheck, it's devastating to the other team because we're going on offense and they're trying to react to us. (Our) transition game is going to be key [because] we're on the big ice surface." Up front, Housley said he was happy with the chemistry created by a few forward lines. The top trio of Sean Kuraly centering Mario Lucia and Stefan Noesen dominated the score sheets. Kuraly, a 2011 fifth-round pick of the San Jose Sharks, led all players at the camp with six goals and nine points. Lucia, a Minnesota Wild prospect, had a hat trick in a split-squad game against Finland, and Noesen, a 2011 first-round pick of the Ottawa Senators, tied for the camp lead with four assists. Another line Housley said he liked featured Alex Galchenyuk, taken by the Montreal Canadiens with the third pick of the 2012 draft, centering left wing Reid Boucher, a New Jersey Devils prospect, and J.T. Miller, the New York Rangers' 2011 first-round pick. John Gaudreau, a Calgary Flames prospect, also was productive playing with Galchenyuk and Miller. "I was pleased about the whole week. Especially after the first couple days, it seemed like we were a little sluggish. (It) seemed like our games picked up in the third game and the international competition. I was very pleased by their effort. (I) talked to them, sent out the letter in June, to come prepared, and for the most part all of these guys worked hard and came prepared for this camp." Housley also said he liked a line that featured Florida Panthers prospect Vincent Trocheck centering Miller and Nicolas Kerdiles, a 2012 Anaheim Ducks draft pick. "We tried to put guys together that would complement each other," Housley said. "Sometimes it doesn't work out that way because you're trying to give guys a chance to play, to see what they can do. For the most part, three of those lines that we had I thought had good chemistry. The Kuraly line, the Galchenyuk line, even J.T. Miller, when he was moved back to the third line, I thought did a great job, with Trocheck and Kerdiles. They're high-end offensive guys and they provided that. That's intriguing." In goal, John Gibson -- with Trouba and Miller the only players who played for Team USA at the 2012 WJC -- did little to change the fact he's the front-runner to have the No. 1 job for this year's tournament. In two games of international play, he allowed three goals on 50 shots in wins against Finland and Sweden. Garret Sparks, Anthony Stolarz and Jon Gillies also performed well in their auditions, and all bring similar traits -- each is at least 6-foot-2 and very athletic. Stolarz and Gillies are 6-foot-5. "I'm happy definitely," Housley said of his goalies. "They gave us a chance to win and that's what we're looking for." With the first step in the audition process complete, Housley and the USA Hockey staff will spend the next few months evaluating players as they return to their club teams and start the 2012-13 season. Team USA will reconvene in December for another camp before it heads to Russia. A lot can happen between then and now, and Housley said there will be no easy calls when it comes time to fill out his roster. "We have a lot of tough decisions," he said. "There's a lot of time between now and December. There are going to be guys going back to their own teams in different roles and maybe they'll be gaining a lot of confidence in those roles. We're going to continue to evaluate everybody."